If there's one item that I've absolutely fell in love with from the Lauren Conrad Runway collection, it's this lace top with trumpet sleeves. It goes perfectly with the 70's revival that's going on right now in fashion. Is it just me or is it awesome to wear pieces that were popular in the past? Personally, I always felt like I was born in the wrong time so being able to wear clothes from past decades seems right. I'm interested to see what the next fashion revival is going to be! Let's talk about the top: The scallop edges, the lace pattern, and the gorgeous sleeves is perfect for pairing with a fancy skirt for a night out or even with some high waisted jeans for a casual look. I paired it with my favorite J. Crew skirt and Sam Edelman flats that works with my girly sense of style. If you're interested in this top, I highly recommend buying it now since I'm sure it's going to be sold out quick. Especially because Lauren Conrad wore the white one during the finale of her fashion show! This color is so pretty! I love the top. So gorgeous! I must say that I am completely obsessed with this skirt. I remember seeing it at J.Crew and now I am kicking myself for not buying it. 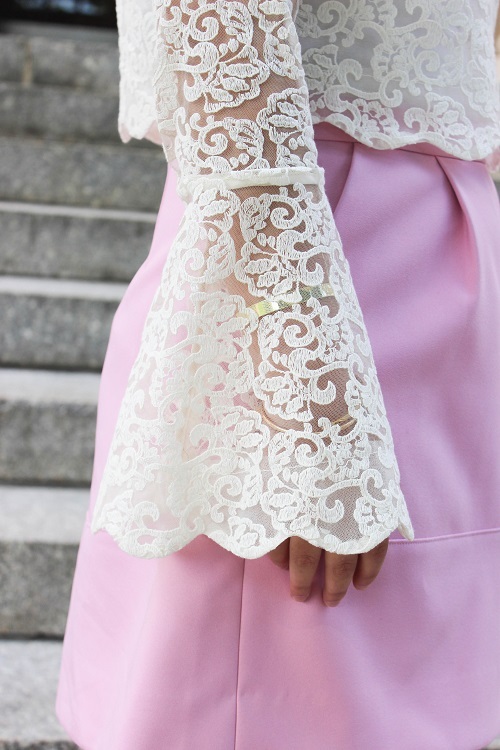 love to see lace paired with pink. it's just so feminine. Love that color combo! So classy! That pink is pure perfection on you my dear! SO romantic and gorgeous! I love the scalloped edges and delicate lace. Thanks for sharing! Your shirt and shoes are to die for! I am so obsessed with that top, it seriously looks gorgeous on you! That top is absolutely gorgeous! I am obsessed with lace! This top is too cute! Love that you paired it with such a pretty pale pink and those fun printed shoes! Such a pretty and feminine look! Such a cute outfit! Love that pale pink on you. I love the ultra girly outfit! The lace top is feminine and so is the color of this skirt! I'm in love with Lauren's Runway collection this year. This shirt is a must-have! You look beautiful! Ohhh I love this top! The sleeve detail is too, too cute!! I am absolutely in love with that skirt! The pink is perfect on you! I'm in love in Lauren Conrad's line - and how fun is that top?! The bell sleeves are to die for! Omg I am absolutely in love with this convo! It is stunning. Love those sleeves and that skirt! So so so cute! Lace and pink are my favorites... love it! That top is stunning! Lauren Conrad did SUCH a great job on her runway collection! That top is soo cute, love the lace! I love your outfit! 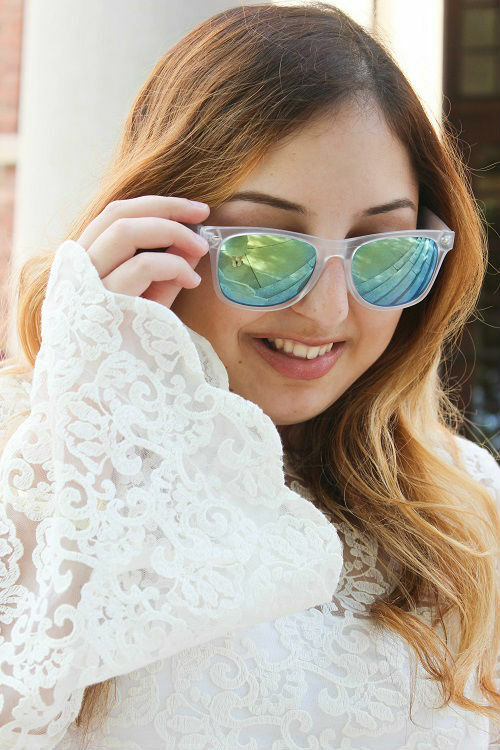 A little ladylike lace never hurts! Beautifully crafted dresses.You look really gorgeous.Please keep updating.